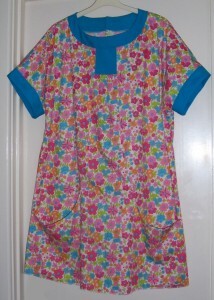 Here is the first tunic top made from the out of print pattern that I purchased from an Australian eBayer. As it was the first test garment I decided to use some pretty floral 100% cotton print from my stash and as luck would have it, the contrast fabric is a remnant of duvet cover which matches the shade of turquoise in the print! I cut the pattern to a size 22 with no alterations even though my personal dimensions exceed those stated on the pattern envelope! I followed the construction procedure to the letter and now have an excellent knowledge and understanding of what alterations to make for the next project. The size 22 is fine but could do with an additional couple of inches ease over the hips. There is no need for a slit opening and button fastening at the back neck as the garment can be put on pullover style. 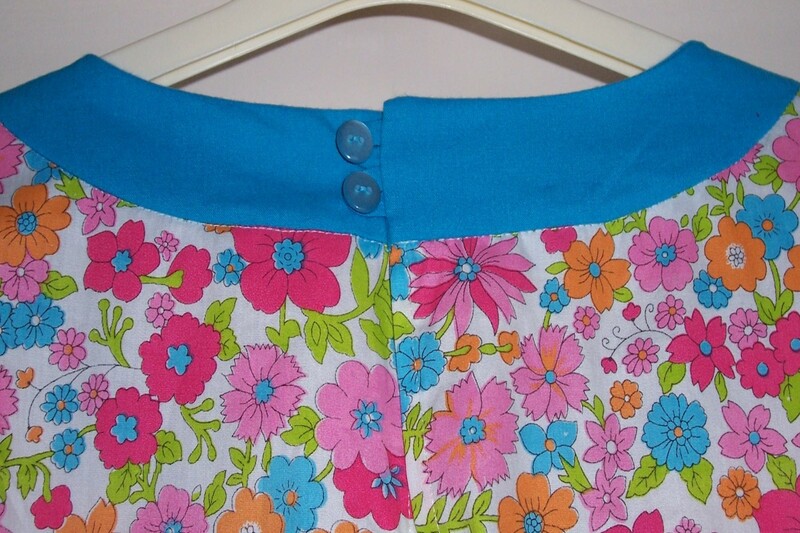 On this top I have not quite aligned the top of the neckband but as it will be under my hair is of no consequence. Although the panel seams and inset pockets look complicated, provided you mark all the dots, take it steady and follow each step they will turn out fine. Additional top stitching on the neck band would be good. For the tunic length I do not need to make a sway back adjustment. Finally, make the sleeve cuffs as bands and not turn backs as otherwise they make the kimono sleeves very short and visually add width to the bust line. For the next incarnation of this pattern I fancy a plain lightweight denim to be topstitched in a contrast thread. We shall see……. I have found that WordPress fulfills all my needs and it was very simple to set up and run. Why pay for something more unless you have greater aspirations for your blogging? Good luck! Assolutamente d’accordo con lei. Credo che questo sia un concetto molto diverso. Pienamente d’accordo con lei. TRANSLATION: Absolutely agree with you. I think this is a very different style.